Rare Volupte Perfume Atomizer Bottle This was their Imperial Size Bottle measuring 9.5 inches Tall. The Imperial Bottles are very desirable and are of very high quality. Feels very rich when held. 22 kt Gold paint of the Greek Key Extravagant 22k gold gold plating Long Slender Body Slim Arsty Stem The bottom side of the foot is embossed Guaranteed 22kt Gold Plating Original Volupte Hardware, Hose & Bulb Has it's glass draw tube with no chips or breaks. The top fits perfectly with no problems. No chips or cracks, no gold loss, Signature Hardware (used only by Volupte) THINGS TO POINT OUT: Reflected in this Great.. Low Price The gold plating is worn off from use in some places, mostly where you would handle it by picking it up at the middle of the stem. Not dirty but just the gold is lighter in certain areas. Not touched up or painted in any way.... See close up in very last picture. The bulb has hardened with age. Still shows nice, but if you plan to use it you will need to replace it. This bottle will be double boxed for a very safe trip. See my other Volupte Perfume Bottles.. DeVilbiss As with all of my items, this item is FINAL SALE, AS IS, and is NON-RETURNABLE, NON-EXCHANGEABLE, and NON-REFUNDABLE. I have described condition as best I can, but in some rare cases, there may also be other, hidden issues which I have not noticed; if so, they would be very minor and/or likely normal to this type of item, perhaps even from original manufacturing. In that rare instance, my statement of my terms continues to apply. You can expect your package to arrive sound. I pride myself on carefully packing your investment. In many cases I double box for a safe trip. If winner please contact me for actual cost or go ahead and pay... Antique 9 Volupte Glass Perfume Bottle Atomizer Imperial Size 22k Gold Plating. Rare Volupte Perfume Atomizer Bottle. This was their Imperial Size Bottle measuring 9.5 inches Tall. 22 kt Gold paint of the Greek Key. Extravagant 22k gold gold plating. The bottom side of the foot is embossed Guaranteed 22kt Gold Plating. 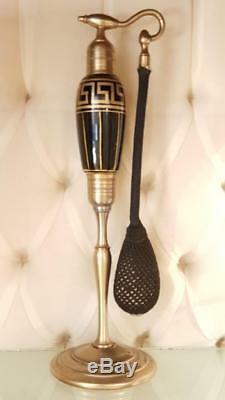 Original Volupte Hardware, Hose & Bulb. Has it's glass draw tube with no chips or breaks. No chips or cracks, no gold loss, Signature Hardware (used only by Volupte). THINGS TO POINT OUT: Reflected in this Great.. The gold plating is worn off from use in some places, mostly where you would handle it by picking it up at the middle of the stem. As with all of my items. This item is FINAL SALE, AS IS, and is NON-RETURNABLE, NON-EXCHANGEABLE, and NON-REFUNDABLE. I pride myself on carefully packing your. Antique perfume bottle, antique compact, French compact, DeVilbiss perfume atomizer, Hoffman perfume bottle. Auctiva offers Free Image Hosting and Editing. The item "Antique 9 Volupte Glass Perfume Bottle Atomizer Imperial Size 22k Gold Plating" is in sale since Wednesday, June 27, 2018. This item is in the category "Antiques\Decorative Arts\Glass\Perfume Bottles".